CafePress brings your passions to life with the perfect item for every occasion. With thousands of designs to choose from, you are certain to find the unique item you've been seeking. Personalize your bedroom and protect your pillow with a stylish and coordinated pillow cover. Our pillow cases feature your favorite decorative or vintage design vibrantly printed on a soft 100% woven polyester case. This standard size pillow case measures 20"x30" and fits most pillows. These pillow covers make great house warming gifts, and are a great gift for women, men, boys, and girls or a luxurious indulgence for yourself. And with CafePress, your satisfaction is always our promise...buy with confidence, as we offer easy returns and exchanges and a 100% money back guarantee. This standard size pillow case measures 20"x30" to fit over most pillows (not included), and is made of 100% soft woven polyester. Our pillow covers are professionally printed on the front, so your unique design will look great and make someone smile with the decorative artwork. The back is unprinted and is a luxurious white color. Treat yourself, or make this pillowcase the perfect housewarming or wedding gift, or give it for Mother's Day, Father's Day, Valentine's Day, Christmas, birthdays, anniversaries, or for no reason at all! This pillow slip is open on one end for easy access to your pillow (zippered closure in the EU). 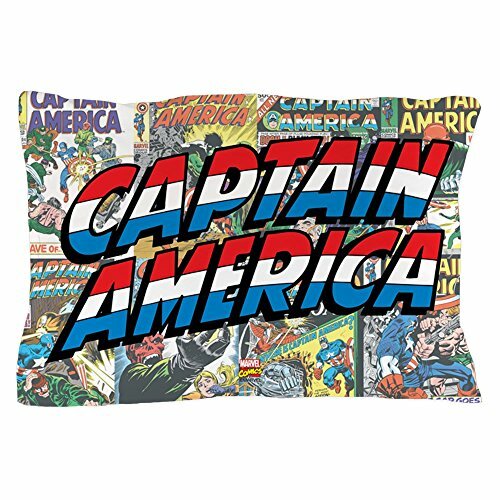 Captain America,Shield Micro Raschel Throw Blanket, 46" x 60"